Report on the two refugees families from Rwanda via Congo, then Uganda. Through a friend called Francine working in the Italian Embassy, MS. Rose Busingye (director of Meeting Point International was able to know about the two refugee families. She was moved by their situation and in this way she sent social workers to follow up these families and to find ways how they can be helped. We found that, these two families (10 members) originate from Rwanda in central and East Africa. They left Rwanda because of the inter-tribal war between the Hutu (majority) and the Tutsi (minority) that resulted to the 1994 Genocide. By early July 1994, forces had gained control over the country, including Kigali the capital city of Rwanda. In response, more than 2 million people, nearly all Hutus, fled Rwanda, crowding into refugee camps in the Congo (then called Zaire) and other neighboring countries. This war claimed many lives, many people were separated from their families, and displaced, lost their jobs and many people lost their qualifications in the burnt houses. These families makes me realize that, the gift of life is given to us by God and very precious. Every time we all struggle to live our lives to the fullest we run the risk of forgetting that the one who gave it us has power over it. The most important thing is to always learn to love ourselves like the way these families love themselves and in this way we shall live our lives according to God’s will. This is because if you love yourself, it is easier for you to also love your neighbor and give value to the others in life because in life there are circumstances that are beyond our control but all we have to do is to face the reality and in this way we are able to overcome these situations just like the way this family did. These families are always moving together, you cannot imagine the mutual relationship that exists among the family members, they do not want to leave each other. When times became tough for them, they went and hide in the forests of Congo, they could not what was happening in that area. After some time when insecurity persisted in Congo, they fled to Uganda but since ‘’tough times never lasts but tough people do’’, which reflects to the love that these two families shared. In Uganda, these families settled in Kakiri found in Wakiso District which is in the central part of Uganda, where they are staying in the same house that was given to them by a friend. The heads of these families were primary teachers in Rwanda but they lost all their qualifications in the burnt houses during war. People always say that you will never know how “hot fire is unless you step in it yourself”, this is because we always don’t take the situations other people are going through unless you also go through the same situation. In order to fit in one’s shoes, you should be aware of yourself and your freedom. In order to earn a living, they resorted to doing casual work like washing clothes, fetching water, digging in the garden for people and at the end of the day they are able to get what to eat. All this was so challenging for them because they never knew the local languages that are used in Uganda but all in all they were able to live happily in the society. Rose embraced them with the love of Christ and the value they have in them and with the love that they shared, they were inseparable because Rose tried to take the children to the Welcoming House so that they could be able to get the basic needs but they were inseparable, the children resisted because they could not imagine leaving other family members. I was also moved with this family because amidst all the trials, whether young or old, they were ready to face it as a family. The more you realize yourself the more you will know about your neighbor, all this comes after one discovers him/herself. Rose could not imagine one man who moves into people’s homes looking for a job to dig in order to exchange for food, in order to feed ten members. During our recent visit, I visited the family, because we had managed to take three children to school while the two remained at home as we were getting a solution for them to start school in 2016. She was being disturbed by the other two old children who were not going to school, they kept on asking her ‘why they were not going to school yet their brothers were going there’ so we had to organize with the head teacher of the school so that he would allow them in school the coming year since it was already in the middle of the term. We also discovered that just the little support that we had given them, the two women who were living with the children had discovered a skill of making bags out of beads in different colors, they looked nice and for sure, we realized how grateful it is to help such kinds of families, I the social took the photos, Rose Busingye was moved by their creativeness and she asked them to bring samples and she will help them to sell them through Meeting Point International, the income they will get will help them improve their standards of living. Report of child letter exercise at both Luigi giussani High school and Luigi Giussani pre-primary and primary school. Children writing letters, poems, stories and draw good pictures. Child Letter Exercise is an activity where children share their life experiences to the sponsors who support them in education. They write letters, poems, stories and draw good pictures expressing their happiness to their beloved sponsors. This activity started on 1 /11/2015. We started with the candidate classes of senior four and senior six of Luigi Giussani High School. It was very easy for us to deal with these students because they are adults and know what to do. After working on the candidates of Luigi Giussani High school, we came back the following day and worked on other three classes, senior three, two and five. They were very happy to write to their sponsor, they shared many things with them for example they talked about the school activities that took place in their school like Music, dance and drama, sports day and also the situation in their families. They were very cooperative with us and this made the exercise run very smooth. When we reached in senior one, it was so attractive the way the children wrote their letters, they were full of love and passion while carrying out the exercise. After completing secondary , we then went to the primary section . we also started with the candidate class primary seven. It’s a very exciting moment most especially the young ones in Nursery and Primary.They are very eager to write letters, poems and stories. Every child wants to be the best in this exercise. Children of P.5 to P.7 are good in writing letters, poems and stories while those of P.1-P.4 are good at drawing pictures and shading. The nursery children know how to shade pictures. They are the youngest at Luigi Giussani Pre-Primary and Primary School. The education system in Uganda goes into stages and this is the first stage of child development. A child is born with an empty mind however the environment keeps filling it that in the end the child becomes Human. Luigi Giussani Primary is a school that grooms children to become human through teachers, Social Workers and the Executive Director of Meeting Point International (Rose Busingye). It starts from infancy stage through the Nursery teachers of the school then to the Adolescent stage. I myself feel great while carrying out this exercise because I like interacting with children and this exercise made me feel good seeing the children eager to participate in it and share with their sponsors what really on their mind and it also gives me a chance as a Social Worker to interact freely with the children and understand them better. 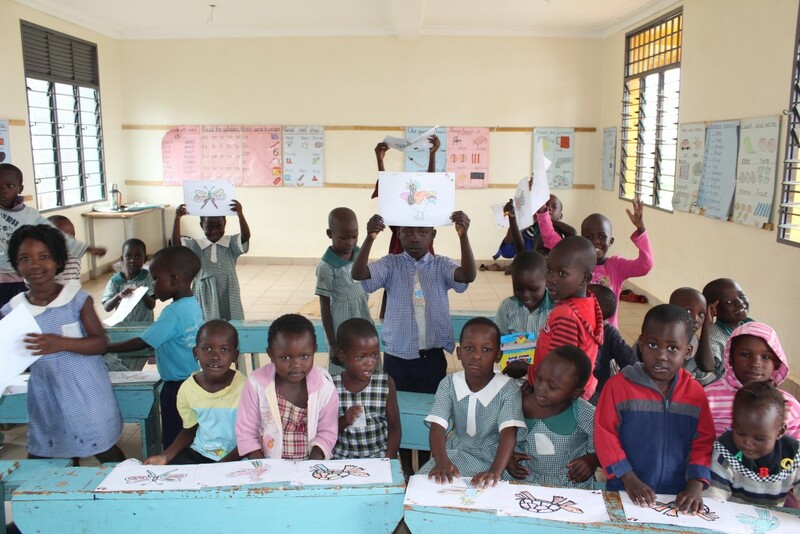 Social Workers helping children of baby class to shade drawings for their sponsors. They are all very excited. The one on your right is a Social Worker called Gashumba Emmanuel of Meeting Point International and the one on your left is Muhimbise Elizabeth a Social Worker from AVSI. They are showing us how they managed to shade nice drawings. In this activity, we encourage young children who cant write to shade drawings with the most beautiful colours to their sponsors. Abandoned children find 3 families among the women of Kireka Acholi Quarter. “The heart of man is one and it is the same in Italy, in Uganda and in every place. When you know that you have a value, you know that also the others have a value”. “ Why did these women, that have their own children, decide to take another child and to take care of her?”. Teddy smiles at me and she says: “We have received a great love, a love that says to us that we have a value, that we have our own dignity. We have been looked as beautiful persons. At the beginning, when I looked at myself I didn’t see nothing, I was nothing. Then I met someone who looked at me not for my errors or for my limits, but for my desire and for my value as a human being. I wanted for myself that gaze, so I have started to stay with the people that loved me. Now, I and also the other women want to do the same with everyone. The money are not a problem in front of this great love. I feel happy when I can help someone to be happier. I started to work as a social worker for this reason, I love to stay with people and to go along with them looking for their value. This is my life, and I love my life”. She introduced me to Apolot Florence who is taking care of Mugerwa Sharon, who is 7 years old. She said: “When Rose came and asked us what we should do with the abandoned children I had no doubt. These children have a value like me and like you. When I was in need, someone took care of me and of my childen without asking me anything, we have been loved as we were. I want to love as I were loved. Sharon is now happy, the first week that she was with me and with my children she didn’t play with them and she was apathetic, but then she felt loved, she felt at home, and she completely changed. Now she is attending P1 in Luigi Giussani Primary School, she eats properly and she plays with her friends”.